Super-Charged NXT LEGO Robotics Projects! Get ready to take ultimate control! Using the NXT Intelligent brick from LEGO, servo motors, advanced ultrasonic, touch and light sensors, and specialized Lego technic engineering components, students will build extreme robots, program them to accomplish tasks, respond to external stimuli, and overcome challenges. Students working in small teams will control the robot with NXT programs, and then have the opportunity to experiment and modify the programs. 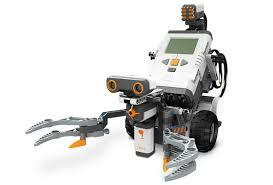 Students will then be challenged to morph their projects in better, stronger or faster robots. Possible competitive robots built are Tug-O-War bots, hammer-bot, a claw-striker, and Sumo-bot.